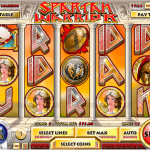 Spartan Warrior is a 5 reel, 20 paylines slots game by Rival. As the name suggests the theme revolves around Ancient Greece and to be exact the Spartans. Sparta was a city-state in Greece known for it’s fierce warriors who never lost a fight. The Wild in this game is the Crossed Swords symbol. It will substitute other symbols to help to create a winning combination. There are also two scatters in this game. 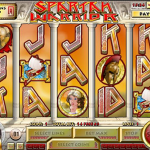 The first scatter is the Helmet symbol and landing 3, 4 or 5 will win you 10, 20 and 100 Free Spins respectively. Moreover, all your wins during this round come with a 3x multiplier and a chance to re-trigger both the free spins and the bonus features. The second scatter is the Shield symbol and landing 3 or more will trigger the Bonus Game. Here you will pick and weapon, then an opponent to fight with. From there you watch the fight and hope for the best. The better your warrior does the more you win. Spartan Warrior is a pretty cool game with a good theme and great bonus features. The only negative about it is the old graphics which doesn’t really compare well with recent game. Other than that this game is sure worth a try! Are you an 80s fan? Try playing So 80s a 5 reel slot by Rival.